She expects… to win? or winning? I avoid… to go? or going there? How often do you have a problem with gerunds (winning, going) and infinitives (to win, to go)? From my experience, this is one of the most problematic areas for my students. Watch this video to get an easy trick to remember when to use gerund or infinitive. I call these tricks Grammar Hacks. Also check out the practice activities under the video (Elementary, Intermediate and Advanced levels). If you have any questions – leave a comment. 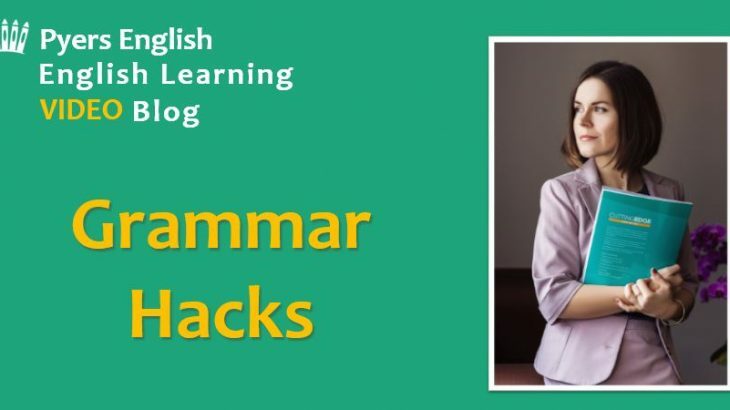 If you don’t want to miss the next Grammar Hack, follow me on facebook or twitter. REMEMBER: Grammar Hacks only work in 80-90% of cases. With gerund or infinitive, one common example is suggest. We say, I suggest going to a party. Of course, I suggest now, but we’ll go to a party later. So in this case the Grammar Hack doesn’t help. IMPORTANT: when there is a direct object pronoun after the verb (for example, I advise you/him/her/them…), you should use an infinitive! So, I advise you to buy it. Disclaimer: Grammar Hacks are NOT real English grammar rules. They are just patterns that some teachers and speakers have noticed in the English language that can help you remember things quickly and easily while speaking. Learning and using Grammar Hacks does NOT guarantee perfect knowledge or zero mistakes in English. But they can help you reduce the number of mistakes you make. English Learning Blog, Slider. permalink.